While volunteering in Big Sister E's class recently, I was able to help the children with an art project based on the phrase, March comes in like a lion and goes out like a lamb. Although every year I'm eager for March to usher in spring, this year in particular I'm really hoping for that lamb to hurry up and arrive. Freezing temperatures and snow that just won't quit? No, thanks, I'm ready for sunshine, warm weather and being able to pull open the doors to my daughters' closets and see the adorable and affordable fashions awaiting them inside. Which is why I love seeing all of the stylish, colorful, comfortable and fun options in the Easter collections at OshKosh B'gosh. Founded in 1895 in Oshkosh, Wisconsin, OshKosh B'gosh is the leading provider of baby and young children' apparel. Offering everything from casual playwear to special occasion dresses, each item stays true to their roots of quality, durability and craftsmanship. 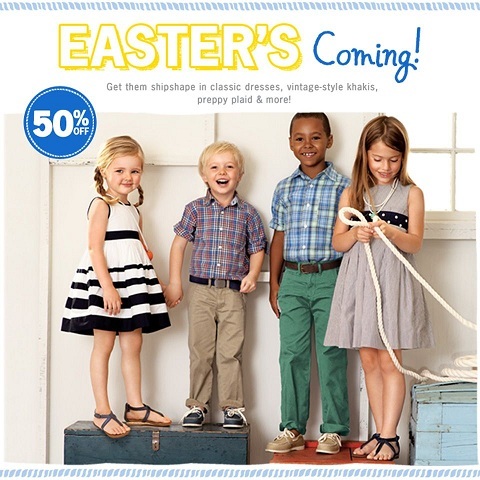 And now is the perfect time to get ready for spring by shopping at OshKosh B'gosh online or in-store to receive 50% off all Easter dressing with new girls clothes and boys clothes. Can you beat that? 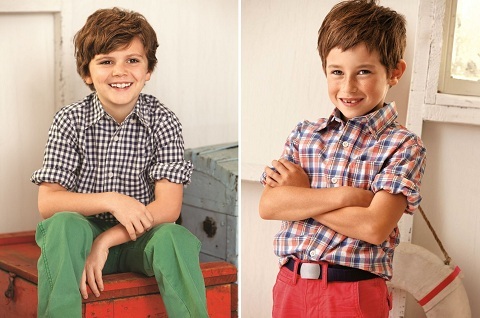 For boys, dress him up in plaid button downs, sweater vests, colored khakis, or twill pants. These looks are comfy and easy to wear, and they look extremely cute as well. You can even complete the look with topsiders, great for dress up or casual outfits. For girls, on the other hand, it's easy to give her lady-like style in kid-friendly cotton. Whether you're looking for nautical touches, floral prints or stripes, you will be sure to find the perfect Easter dress. Shop cotton dresses with sweet girly details she'll love and complete the look with ballet flats and headbands in bright, fun colors. With so many great options to choose from, I can easily see Big Sister E loving the Sleeveless Striped Dress and White Sandals due to the crisp, clean lines and the blue accents (her favorite color). At the same time, Little Sister B, my girly-girl, would go straight for the pink flowery look of the Sleeveless Floral Dress, pink Button Front Cardigan, pink Poofy Flower Headband and pink Striped Ballet Flats. While we haven't picked out our final Easter outfits around here just yet, there is definitely no shortage of OshKosh B'gosh love already on hand. ...we always love the way that OshKosh B'gosh can provide the complete looks (with prices that can't be beat) that make us all happy. Whether your family has big plans for Easter or you simply are as eager as I am to usher in spring, OshKosh B'gosh is sure to have plenty of adorably sweet items in their collection that will showcase bold, bright color, crisp classics, fresh florals and many more that will work for the little personalities in your house. Be sure to check out all of their clothes, shoes and accessories for babies through big kids in store and online and follow @oshkoshbgosh on Twitter and OshKosh B’gosh on Pinterest for outfitting ideas, vintage ads, deals and special events! 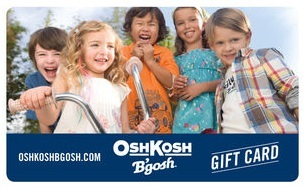 One lucky person will win a $50 OshKosh B'gosh gift card! 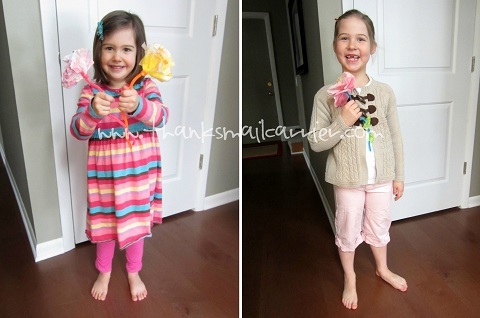 OshKosh B’gosh partnered with bloggers such as me to help promote Easter. As part of the program, I received product or gift cards. OshKosh B’gosh believes that consumers and bloggers are free to form their own opinions and share them in their own words, and therefore did not tell me what to purchase or what to say about the products I used. OshKosh B’gosh policies align with WOMMA Ethics Code, FTC guidelines and social media engagement recommendations. The winner of any giveaway in this program will be randomly chosen and gift card fulfillment will be handled by a third party. I like the sleeveless floral dress. I really love the Flutter Sleeve Crepe Dress! I love the Green Twill Pants ! I like the Nice & Nautical Outfit. I like the Super Pretty outfit. I like the Navy Boat Shoes! My favorite item from the Girls' Easter collection is the Flutter Sleeve Crepe Dress. I like the khakis, please! outfit for my little boy! I like the "Fresh Bunch" Dress and sweater. I think it is a simple pretty dress. The Sleeveless Striped Dress is adorable. I like the Button-Front Poplin Plaid Shirt. My favorite from the boys collection is the Button-Front Poplin Plaid Shirt. The t-shirt with the tie on it! So adorable. I like the boy's sweater knit vest. I love the Boatloads of Hansome outfit! Love the sleeveless floral dress ensembles. i love the Floral Sleeveless dress! I like the Girls Sleeveless Striped Dress. I love the Sleeveless Striped Dress. I like the Sleeveless Floral Dress with blue flowers. I like the Floral Sleeveless dress. Boo says the Nautical Sleeveless Striped Dress with the Pink Hairband. I love their clothes! So cute! I LOVE this sleeveless floral dress! The boys oxford striped button down shirt. I like the pink Button-Front Cardigan. A pair of vintage khakis with button-front shirt is classic for everyday style. I like the Khakis, Please! for boys. My favorite item is the Sleeveless Floral Dress. I like the green twill boys pants. I like the Sleeveless Striped Dress in blue stripes. Thanks for the chance to win! BOATLOADS OF HANDSOME is my favorite boy's outfit. I like the Nice and Nautical Collection! I love A Fresh Bunch. Colors are so pretty. I like the Boatloads of Handsome outfit for little boys. A Fresh Bunch is my favorite girl's Easter item. Ah definitely loving the sleeveless floral dress and the striped ballet flats with the navy blue flower! I'm not a big fan of the pastels usually associated with Easter, but I adore that blue! I love the Sleeveless Striped Dress! A Fresh Bunch Outfit...the entire outfit which is way too cute!!! I love the nice and nautical girls dress with the classic white sandals! Thanks. For a classic girly-girl look this season, a yellow floral dress, pink cardigan and striped Mary Janes. I did not know they made such fancy, pretty things for girls!! I want the sleeveless fancy dress!! In Floral. We love OshKosh quality, we have a VERY active boy! The Nautical Sleeveless Striped Dress. I like 'Ties and All' outfit! i like the Oxford striped shirt. I love the sleeveless sailor striped dress. so cute! I like the little girl's flutter sleeve knit top. I like the oxford stripe shirt for my son! He would look sharp in that! I like the boy's TIES & ALL Outfit. Thanks so much for the fantastic giveaway! I like the Twill Pants in khaki. I like the Khakis please outfit for boys. I like the flutter sleeve crepe dress. I like the girls' white sandals. They remind me of a pair I had when I was a kid. I love the Sleeveless Floral Dress in yellow! I like the little Boat Shoes for Boys! I love the OshKosh University outfit for boys! 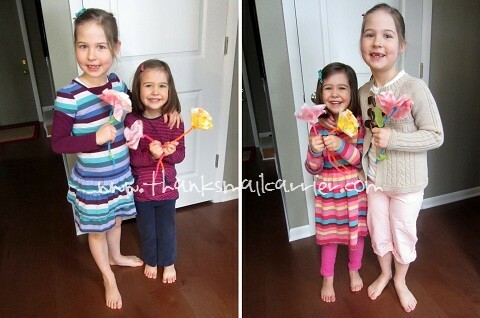 I love the sleeveless floral dress & white cardigan for my 2 granddaughters! I love the Boat Shoes paired with Ties & All. Thanks for hosting this great giveaway! I like the "Super Pretty" girls' outfit. I love the Ties & All boys outfit. Love the sleeveless floral dress! I love the Sleeveless Floral Dress Set. I like the Super Pretty Outfit! i love the super pretty outfit! I love the boys Ties and All outfit. So cute! 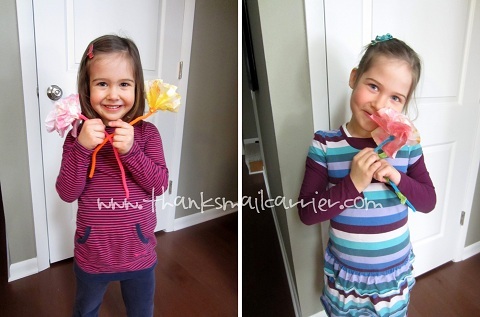 I love the Floral Sundress for my daughter and the Ties & All set for my son! I love the Twill Khaki's. sleeveless floral dress (blue flowers) because it would look good year round! I like the button front cardigan in pink. I love the Skinny Floral Cargos! Flutter Sleeve Crepe Dress, so adorable! My favorite is the Boatloads of Handsome outfit. I adore the striped ballet flats in the girls Easter collection! Adorable!!! The girls Sleeveless Striped Dress in blue stripe is adorable! I really like the ties and all outfit! I like the girls sleeveless white dress. I love the girls Sleeveless Striped Dress. I like the tshirt with the tie on. I love the boys outfit "A Cool Classic"
I love the "Ties & All" Outfit for boys. TIES & ALL is so cute they all are. I like the button up striped oxford shirt. I love the Short-Sleeve Mini-Floral Dress! I have the girls covered, but need something for my little man. I'm loving those plaid shirts and colored pants! I like the white and blue Sleeveless Floral Dress. I like the colored twill pants for my lil boy. Love the Khakis, Please! outfit for boys! My favorite from the boys section is the A COOL CLASSIC outfit. I love the boat shoes & khakis! I LIKE THE KID BOYS LAKESIDE COLLECTION ITH THE BMX BIKE, SHARK. I love the Flutter Sleeve Crepe Dress, way too pretty. Love the girls' sleeveless floral dress! Thanks so much! I love the Super Pretty dress. I love the A FRESH BUNCH dress. I love the sleeveless floral dress with the yellow background and pink flowers. It's very classic. I like the Button-Front Plaid Poplin Shirt! I love the button front cardigan in pink. Thanks for hosting! I like the nice and nautical dress. That button-front plaid shirt for boys is just too cute. I like the ruffled blue floral dress, the whole outfit they put together is super cute! The Sleeveless Striped Dress is super cute! I like the plaid poplin button up shirt! For the girls I like the above and the boys I like the plaid shirts and the chambray boys button up shirt that hit the new arrivals. A gingham short with graphic top and sandals are perfect for her fashionable style.